These can be used on Hydros, Riggers or Catamarans of 40" or greater. Made with high quality aluminum, CNC cut to tight tolerances. These come with a cross drilled strut bushing for .250 (1/4") prop shafts. 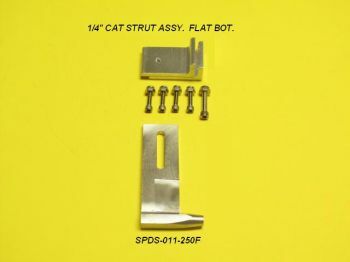 You may have seen this strut elsewhere for a lower cost, the difference is OSE packages these with the brass bushing which most all the other companies out there DO NOT! .250(1/4") Strut requires K&S# 134 5/16" brass stuffing tube.